In Roald Dahl’s Charlie and the Chocolate Factory and the popular film version Willy Wonka and the Chocolate Factory, Willy Wonka manufactures his product with the dedicated labor of the Oompa Loompas. They provide Willy Wonka with cheap labor to which his competitors don’t have access. 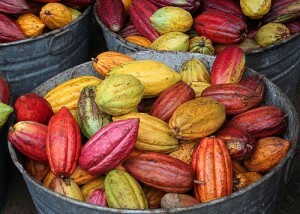 In the backstory, they are paid only in cacao beans. In the book and the movie, the Oompa Loompas are endearing characters, even as their labor upon closer analysis appears to be exploited. It turns out that the Oompa Loompas are real. That is, the major corporations of the chocolate industry, as well as the coffee industry, often rely on child slave trafficking to produce much of the world’s supply of chocolate and coffee. These child slaves are not smiling, cuddly figures like the Oompa Loompas. They are subjected to great abuse. On this Shabbat, congregations across the country are participating in Fair Trade Shabbat to raise awareness of child slave trafficking and to promote the purchase of fair trade products. The following is a D’var Torah connecting this week’s Torah portion, Emor, and Fair Trade Shabbat.